This entry was posted on 11/03/2017, in Editorials, Hard Facts, Hypocrisy, News | Newsmakers and tagged Korea, Sri Lanka. Bookmark the permalink. Some French voters, fed up with their leaders, especially the candidates in the presidential race, recently chose to give vent to their pent-up anger in an unusual manner. They launched a campaign to invite former US President Barack Obama to run for President in their country! They have thus sent a very clear message to the French politicians who have failed to live up to public expectations. Sri Lankans are doubtlessly as resentful as the French where their failed politicians are concerned though it is doubtful whether they are enamoured of Obama’s style of governance. But, they must be envying their South Korean counterparts who don’t suffer crooks in highs posts gladly and are blessed with robust legislative and judicial mechanisms capable of acting against even the heads of state accused of corruption or any other form of wrongdoing. 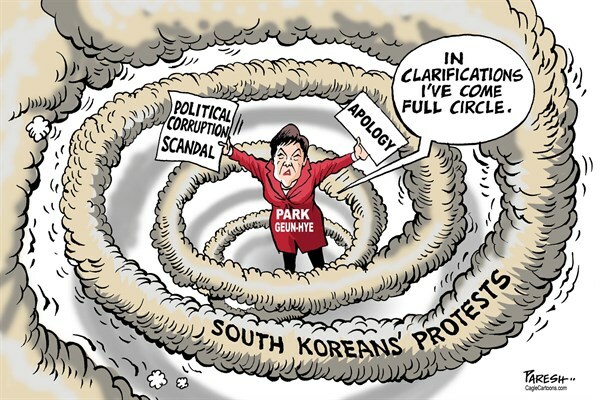 South Korean President Park Geun-hye has been ousted from office. The Constitutional Court has unanimously upheld a parliament decision to impeach her over corruption. She is in trouble because of a friend under a cloud; she is accused of having given the latter free access to state documents and even the pleasure of editing presidential speeches! Now that she has lost her legal immunity, she is expected to be arraigned on criminal charges. Whether she has really run afoul of the law or not will have to be established, but her predicament will certainly serve as a warning to her successors and other politicians. What Geun-hye is said to have committed pales into insignificance in comparison to very serious allegations against Sri Lankan leaders, who are above the law. The present yahapalana government has even permitted their cronies to help themselves to public funds to the tune of billions of rupees. The abuse of workers’ savings in the Employees’ Provident Fund to purchase Treasury bonds is a case in point. Even the family members and cronies of government politicians enjoy legal immunity to all intents and purposes. Only Opposition politicians are arrested and remanded while investigations into allegations against them are being conducted. Many Sri Lankans naively expected the 2015 regime change to pave the way for sweeping political and judicial reforms to strengthen democracy. But, nothing of the sort has happened. The much-flaunted 19th Amendment has not yielded the desired results owing to some serious flaws therein. Its architects sought to further the interests of the UNP-led alliance which they backed at elections instead of helping safeguard the national interest. The so-called Independent Commissions have been reduced to mere appendages of the power that be and packed with stooges. The anti-graft commission and the special police units set up to probe financial crimes steer clear of powerful politicians and their kith and kin for obvious reasons. The self-proclaimed champions of good governance promised us a new Constitution. Now, the SLFP group in the yahapalana government says it does not want the existing Constitution repealed and it needs only amendments thereto. It fears that a plot is being hatched to strip the President of his executive powers and vest them in the Prime Minster. The UNP is determined to introduce a new Constitution, we are told. So, whether we will get a brand new Constitution or only some constitutional amendments, we don’t know. Perhaps, we will be left with neither of them in the end. A prerequisite for strengthening democracy and tackling bribery and corruption is to bring in constitutional provisions for instituting legal action against leaders for wrongdoing while they are in power. If those engaged in constitution making here are genuinely interested in helping battle bribery and corruption they ought to borrow from the South Korean Constitution. We know we are only hoping against hope!